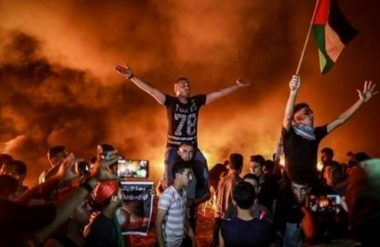 Israeli soldiers shot, on Thursday evening, three young Palestinian men during protests against the siege, east of Khan Younis, in the southern part of the Gaza Strip. Medical sources in Gaza have confirmed that the soldiers shot three Palestinians with live rounds, causing moderate wounds. They added that the soldiers also fired high-velocity gas bombs, causing several Palestinians to suffer the effects of teargas inhalation. Many Palestinians burnt tires near the fence to obscure the sniper vision of the soldiers, and hurled stones across the perimeter fence, in addition to using fireworks. On Thursday at dawn, a child, identified as Saifeddin Emad Abu Zeid, 15, died from serious wounds he suffered late on Wednesday evening, after Israeli soldiers shot him with a live round, and injured several others, during a protest on Palestinian lands, close to the perimeter fence, east of Gaza city.